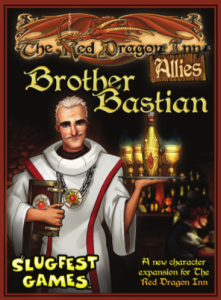 The Red Dragon Inn: Allies - Brother Bastian expands the party at the Red Dragon Inn with a brand new character! Bastian brings a powerful prayer cards with him, giving him more flexibility and secrets than you’d expect from a humble servant of Korash. Making sacrifices throughout the game so you can use your prayers at the perfect moment will lead you to victory!